In the hustle and bustle of daily life, I’ve hardly had any time for myself. While I’ve been able to take care of the things that require my immediate attention, there are some others that I am just unable to attend to. Organizing my assets has been one of those tasks I’ve needed help with and if it wasn’t for F.A.M.P, things could have been really chaotic. F.A.M.P (Find and Archive My Property) is an iPhone app, passed on to me by a developer, that helps one maintain a record of assets, documents, insurance etc. by having it archived in the iPhone. You can use this app to save photographs of belongings like jewels, houses etc or snap up important documents so that they can be preserved for posterity. Whatever your asset maybe, this app helps keeps a record of all details so that you can retrieve them whenever you want to. Once you’ve taken pictures of your valuables, you need to identify them and key in the relevant details such as the name of the property/asset, its description and the estimated value using labels. Items can be located based on pictures or other information. Property can be archived using specific property items, interior and exterior photographs or based on its type. The details of the archive can be edited easily and the archive information can then be exported as a PDF file to your email account thereby having a permanent record of it. To add to its utility, F.A.M.P also has an in-app game called HOT/COLD which provides your family with fun and entertainment. You can choose images from the archive or take some new photos of different items and get started. All you have to do is race against time to locate the items in question. At first, I really did not get what the game was about, as there was no clear information about it. But it turns out to be a game which you play with your family members to identify different items. May be it’s the developer’s idea of family bonding, and to be honest, it kinda gives a feeling of the old times. So with F.A.M.P installed on the iPhone, one doesn’t have to hyperventilate about misplacing valuables or forgetting important document details as they have been archived and it is easy to find them. This compact app can hold a whole lot of vital information and give you the assurance that you can find it whenever you want. 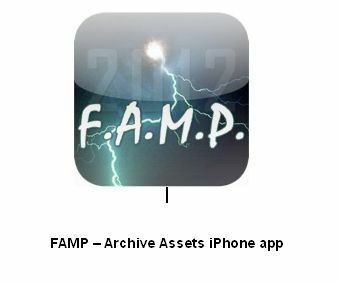 Download the F.A.M P app from the Apple iTunes store for USD 1.99, if you feel you need a handy tool to archive your assets and valuables with detailed information.